Jason and Chris met at my house early so we could carpool through the remnants of Tropical Storm Erin. One or two other folks canceled their plans due to storm concerns, but the rest of us remained optimistic. To get to the coast we drove through many rain bands. Once we hit North Padre Island the weather was OK: overcast, warm, but not wet. It was just like the past few trips: the weather reports make the conditions look much worse than reality. We got lucky again. Before continuing to the beach we stopped at the Island Italian Restaurant for lunch. I tried their Italian Sub. Highly recommended. Just watch out for Elvis on your way to the restrooms. He still scares me, even when I expect him. At Worldwinds, the wind was light and gusty, mostly 8-10 MPH. By coincidence, Ron, the President of the Austin Windsurf Club was loitering at Worldwinds when we arrived. He gave me some harness pointers and made fun of my crazy new windsurfing shoes. Chris took his beginner class and Jason rented a rig while I purchased a harness: a black DaKine T3. My first chunk of windsurfing equipment. Chris finished his class in record time -- ten minutes he claims. He was the only student for the beginner class and apparently he had some prior sailing experience. Jason, Chris and I surfed around for a few hours and enjoyed the peaceful conditions. Chris stopped for a while later in the day and took photos using his new camera and telephoto rig. The photo above is his. 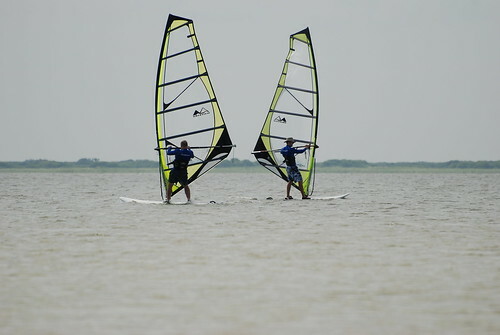 A few guys were out in the shallows taking turns freestyling on an old style Windsurfer. The old longboard with the billowy yellow triangular sail looked strange next to new rigs, but it seemed to do real well in the light wind. Ron came out on a JP 180 and joined them for some freestyle fun. We desalinated at Best Western before Jason, Chris, and I met Matt and Karen for dinner at Waterstreet Seafood. Alex got into town late and joined us for the second half of the meal. After dinner, we played foosball at the Executive Surf Club before we went clubbing. Chris showed off his ridiculous foosball abilities. It would seem that he plays foosball all day instead of actually working at his job. As a result, in many rounds he was the first and last player to have the ball. Jason seemed to pose the only credible threat to the dominance of Chris, although we are all getting much better. It's cool to get the beginner / intermediate perspective on this sport. It sounds like you're learning fast. Keep up the good work with the blog. Thanks James, I appreciate the encouragement. September: When Should We Windsurf?